Have you ever wondered what these birds are? 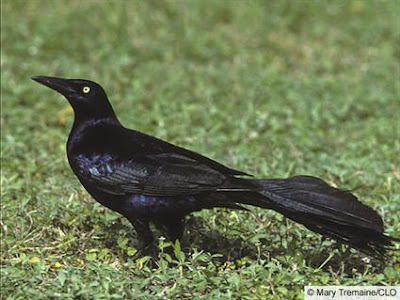 They're grackles. Great-tailed grackles. If you live in central Texas, you've seen large numbers of these flying together and sitting on telephone lines. Today, I observed two individuals. 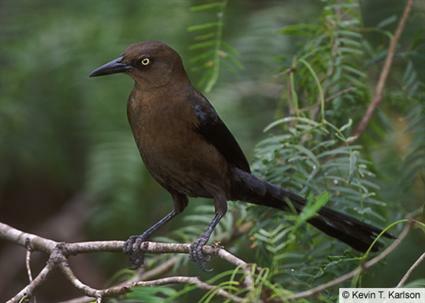 A male (black) and female (brown) effortlessly jumping from branch to branch and making what allaboutbirds.org describes as "a loud series of harsh rattles interspersed with whistling notes and other noises." Their song is distinct and LOUD. I didn't know what they were until I searched my bird guide and then visited allaboutbirds.org to confirm my identification by listening to their song clip. I love when I'm able to identify a bird. Luckily this bird was easy to identify because of their golden eyes. Very striking. I also spotted a hummingbird this morning but have yet to see a bunting this year.